INTRODUCTION: There has been debate as to the feasibility of incorporating MIS into surgical practice in developing countries due to resource and training limitations. 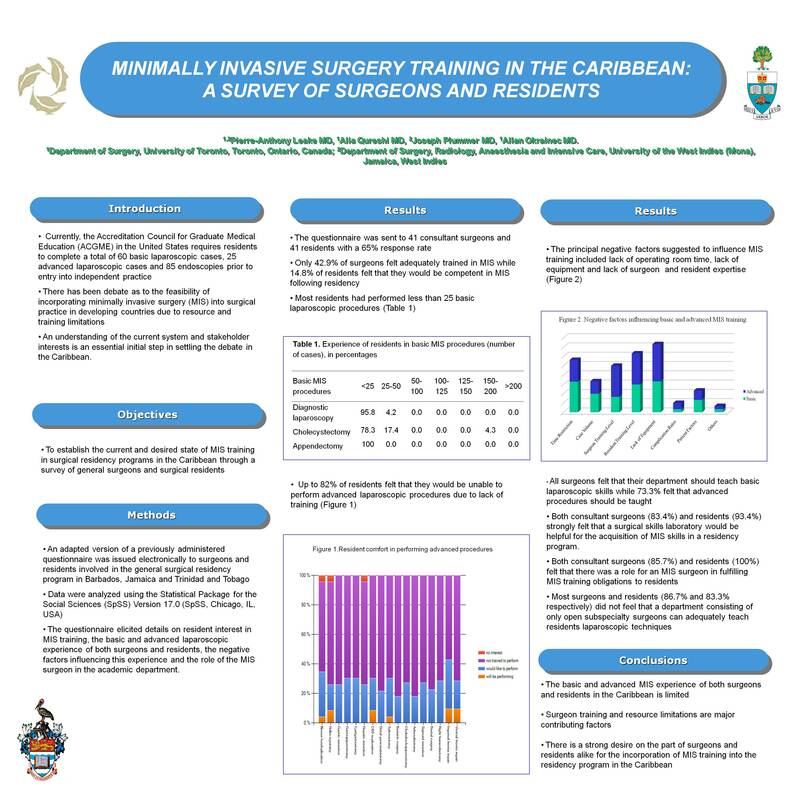 The present study serves to establish the current and desired state of minimally invasive surgery (MIS) training in surgical residency programs in the Caribbean through a survey of general surgeons and surgical residents. An understanding of the current system and stakeholder interests is an essential initial step in settling this debate in this region. METHODS AND PROCEDURES: An adapted version of a previously validated questionnaire was issued electronically to surgeons and residents involved in the general surgical residency program in Barbados, Jamaica and Trinidad and Tobago. The questionnaire elicited details on resident interest in MIS training, the basic and advanced laparoscopic experience of both surgeons and residents, the negative factors influencing this experience and the role of the MIS surgeon in the academic department. Data were analyzed using the Statistical Package for the Social Sciences (SpSS) Version 17.0 (SpSS, Chicago, IL, USA). RESULTS: The questionnaire was sent to 41 consultant surgeons and 41 residents with a 65% response rate. Only 42.9% of surgeons felt adequately trained in MIS while 14.8% of residents felt that they would be competent in MIS following residency. The majority of residents (96.3%) felt the need to pursue an MIS fellowship in order to gain adequate MIS training. Most residents had performed less than 25 basic laparoscopic procedures (cholecystectomy, diagnostic laparoscopy, appendectomy). Up to 82% of residents felt that they would be unable to perform advanced laparoscopic procedures due to lack of training. The principal negative factors suggested by surgeons and residents to influence MIS training included lack of operating room time, lack of equipment and lack of surgeon expertise. Both consultant surgeons (83.4%) and residents (93.4%) strongly felt that a surgical skills laboratory would be helpful for the acquisition of MIS skills in a residency program. All surgeons felt that their department should teach basic laparoscopic skills while 73.3% felt that advanced procedures should be taught. There was great concern that the latter cannot be fulfilled. Both consultant surgeons (85.7%) and residents (100%) felt that there was a role for an MIS surgeon in fulfilling MIS training obligations to residents. Most surgeons and residents (86.7% and 83.3% respectively) did not feel that a department consisting of only open subspecialty surgeons can adequately teach residents laparoscopic techniques. CONCLUSION: The basic and advanced MIS experience of both surgeons and residents in the Caribbean is limited. Surgeon training and resource limitations are major contributing factors. There is a strong desire on the part of surgeons and residents alike for the incorporation of MIS training into the residency program in the Caribbean.